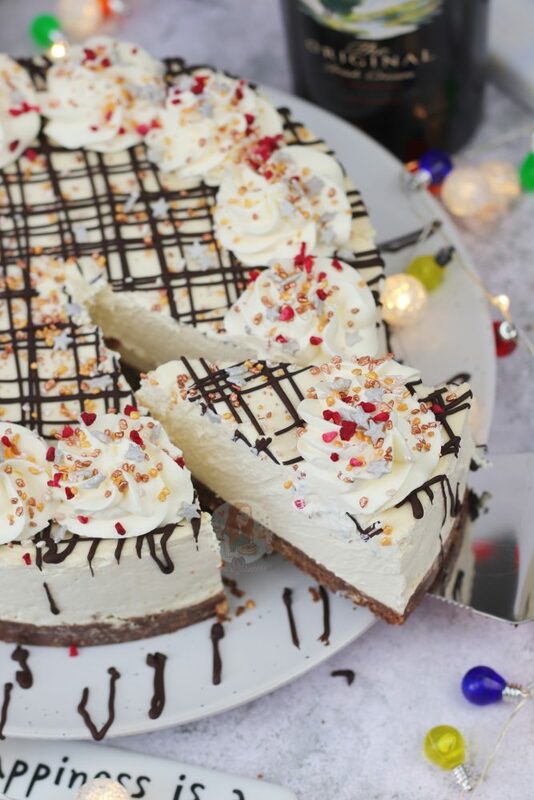 A DELICIOUS No-Bake Cheesecake that is PERFECT for the Christmas Table – a No-Bake Baileys Cheesecake! Yes. That’s right. 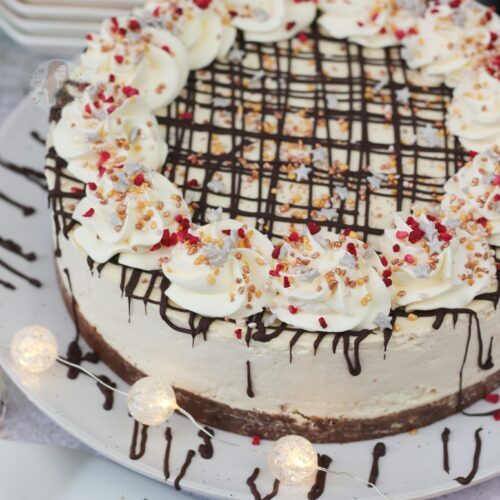 BAILEYS CHEESECAKE! 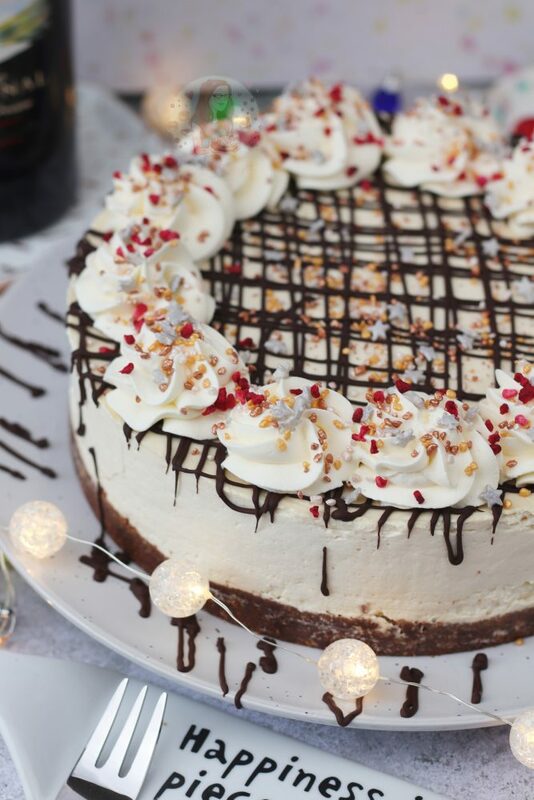 I can explain why there is another cheesecake recipe – I had oodles and oodles of requests for a Christmas/Baileys Cheesecake so how on earth could I disappoint?! Plus – I made this just in time for my Mums birthday, so it doubled up as her Birthday Cake! See – the perfect excuse. This recipe seemed like the perfect way to kick off my Christmas baking and recipe stint on my blog after the recent success of my No-Bake Chocolate Orange Cheesecake that is spreading across social media like wildfire (which to me is also a Christmas recipe!) 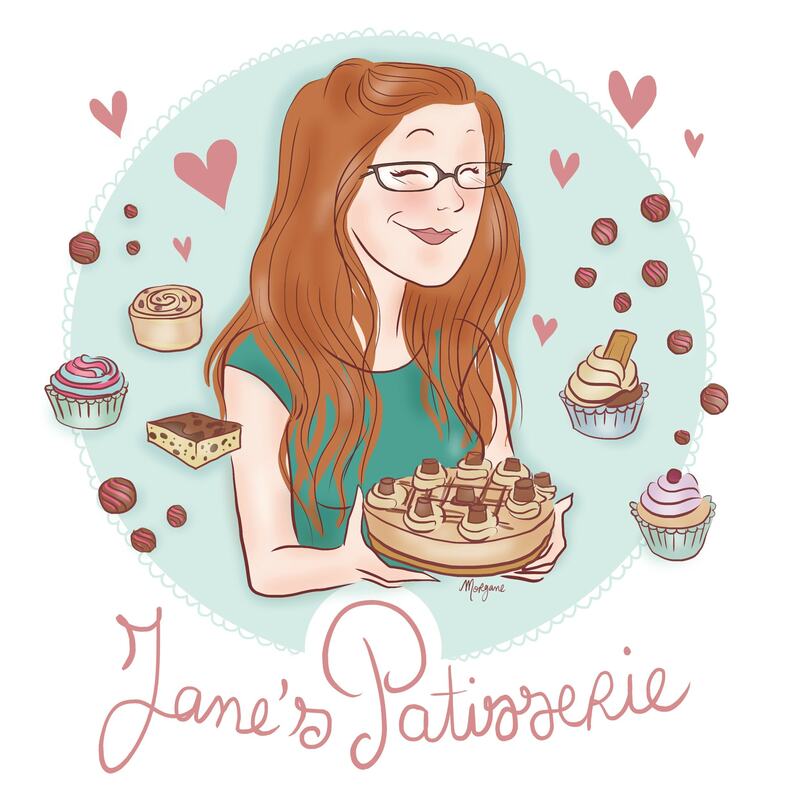 – I really hope you all agree because I am damned chuffed with this one – it really is so yummy! 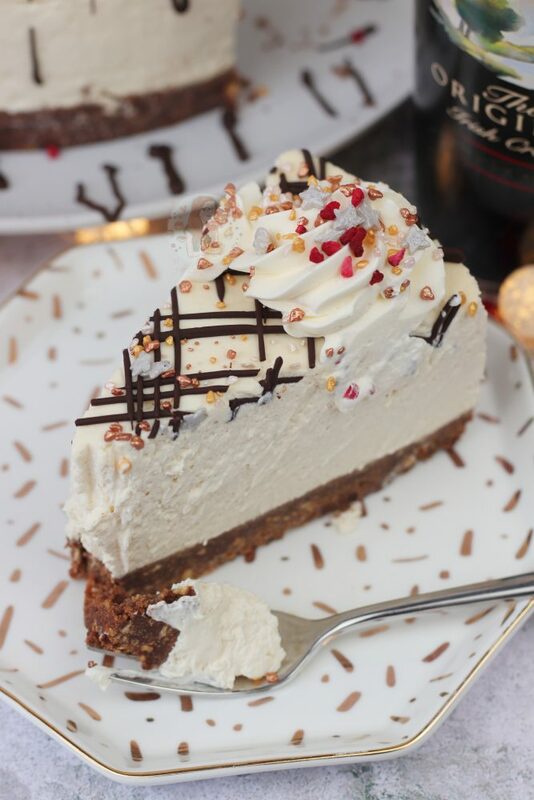 I figured, with the help of my lovely Facebook followers, that Baileys would be a delicious flavour for a Christmas Cheesecake – I don’t know about anyone else, but there is always a bottle of Baileys around at my Christmas events, and this is a delicious way to use some up! 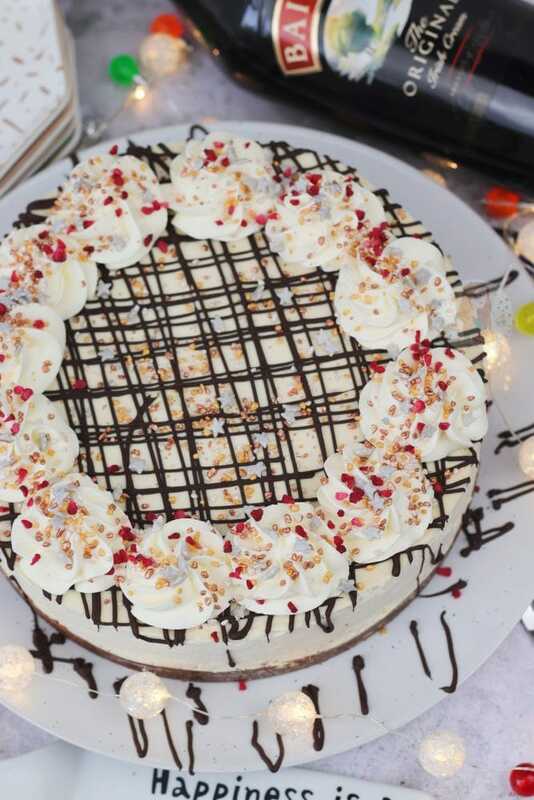 The Cheesecake is delicious and super creamy, and if you’re a Baileys/Irish Cream lover than you will LOVEEEE this one. You may also like my Baileys Truffles recipe! Basically, if you love Baileys then you have plenty of choice on this blog. 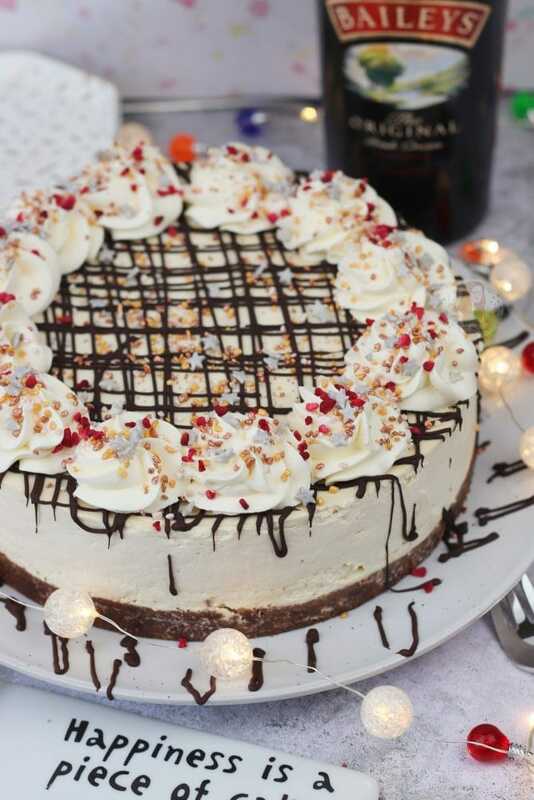 This cheesecake does not use Chocolate to help it set – I tried it a couple of times with Chocolate in, but I felt like it overpowered the flavour of the baileys, and drizzling the chocolate on top worked far better! The base is made up of a mix of biscuits that I love to eat, especially around Christmas time. It is super simple to make too – crush the biscuits & mix with melted butter – press into the base and the base is already done! Whisk together the cream cheese & sugar, whisk in the Baileys, whisk in the Double Cream… pour on and set! Decorate how you please! I really recommend using an 8″/20cm Deep Springform Tin for this recipe as it makes life so much easier. If you use a Springform tin, it helps when you unclip as the tin comes away from the edge of the cheesecake making it less awkward to come out! I personally don’t line my tin, however, but you can if you wish! RECIPE UPDATED OCTOBER 2018 – This recipe was updated mostly for new pictures that I liked, but also to be in keeping with my Baileys Strawberries & Cream Cheesecake! The only difference to this recipe now is using 600g of Mascarpone, instead of 750g, but you can still use 750g if you wish! Blitz your biscuits in a food processor, or bash them up as finely as you can. Add in your cocoa powder if using and blitz again. Add in your double cream and Baileys, with the pink food colouring if using, and whisk again till thick and combined. It doesn't take that long at all, and it's better to be slightly under whisked than over whisked. Melt your Dark Chocolate, and drizzle over the cheesecake. Pipe the Cream around the edges, and sprinkle on your favourite sprinkles! I used the new Baileys Original, but you can easily use the Strawberry one, chocolate one, or even try the Almond one, etc! If you are unsure if it has set correctly, you can add in gelatine to help it set. Use packet instructions to do this. I recommend using this 8″/20cm Deep Springform Tin! 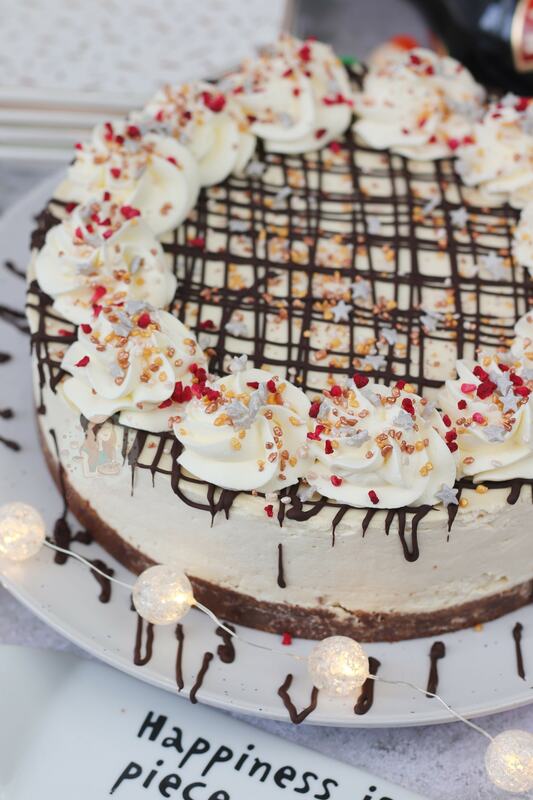 Find my other Cheesecake/Christmas recipes on my Recipes Page! Older Next post: Terry’s Chocolate Orange Pannacottas! 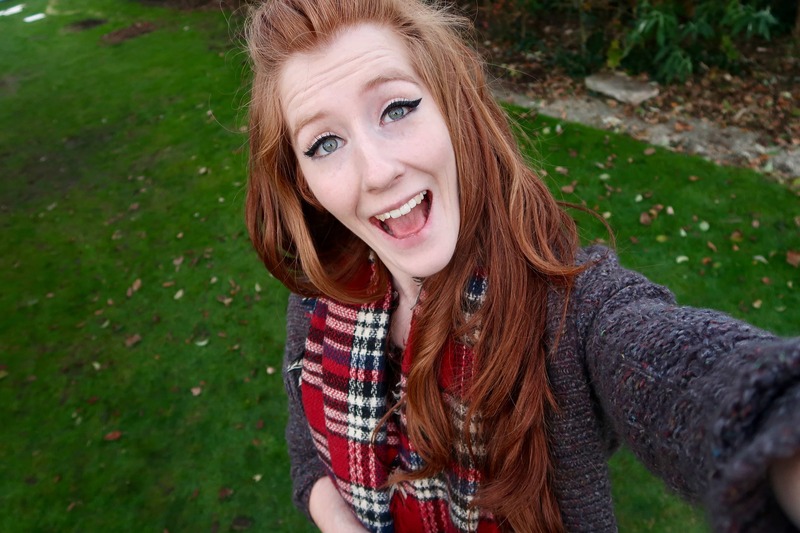 Newer Previous post: Gingerbread Men! Great recipe, if I were to add coffee how much would you suggest? I would personally add Camp Coffee as it’s already got a lot of liquid in the mix so it risks not setting amazing if you add any more – or you can take out 25ml of baileys, and add in 25ml of espresso! Thank you for getting back to me, can’t wait to try it. Tried what you suggested Jane and it worked amazingly well. Thank you so much for the recommendation. Hiya. 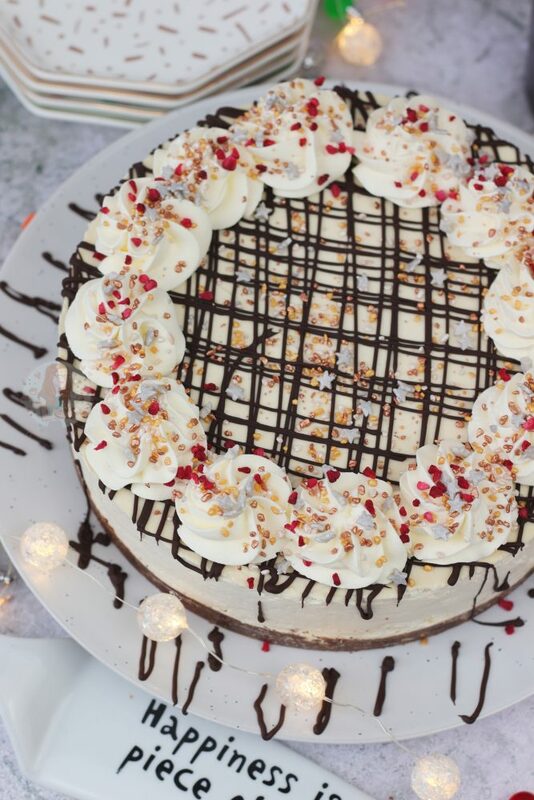 Yeah a cake box will do, its best to stick the cheesecake to the cake board though with a bit of melted chocolate for example though so it doesn’t fly everywhere. And just make sure its fully set and goes straight back into a fridge at the other end. I’ve transported it before by keeping it in the cake tin and then putting it in a heroes/celebrations round tub and taking it out of the tin at the location. I do this when taking them into bake days at work. Hi Jane. I have posted a pic to Instragam with my version of this and tagged you in it. At Christmas (in the UK) they sell double cream with Bailey’s in it and I used this in the mixture as well as the Bailey’s liqueur. I thought it might overpower it but it really doesn’t and might be an alternative to someone who doesn’t want to buy a bottle of Bailey’s for this recipe. Hi, did you use 300ml baileys extra thick cream as well as 125ml baileys liqueur? Did it whip and set well? 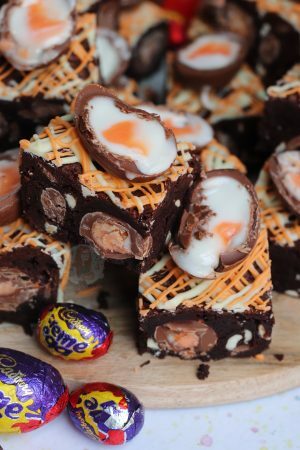 Hi, Sorry I have only just seen your reply to this as I am thinking of making this recipe again this year! I used the large Baileys extra thick cream which is just under 300ml I think but it is so thick it whips really well. I think I did use the 125ml of Baileys as well but just add a little at a time to check the consistency is still right and the strength you want it to be. Can you make this in smaller amounts? Looks delicious. I plan to make it this weekend. Just wondering whether you think it would be best to stick with original baileys or try chocolate or salted caramel flavour? Do you use the centre of the Oreo biscuits or do I scrape the cream filling off the biscuit before using them. Use the centre – I would say to remove the centre if you needed to. You kidding? You should be happy with all your cakes! I would be if mine turned out half as good as yours. 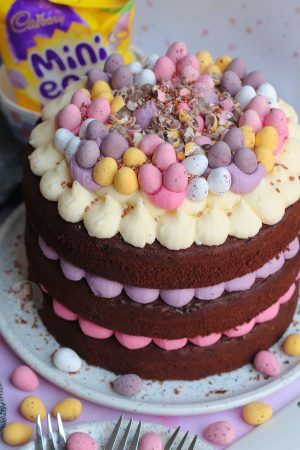 A colleague asked me to bake a cake for her yesterday, I’m going to lurk around your site for inspiration! 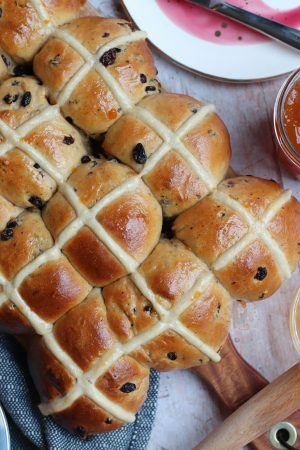 Would you be able to make this in advance and freeze it to defrost on the day? ? This looks amazing and I love Baileys…so…? Hahah you should definitely make it then! Think it’s a plan ? 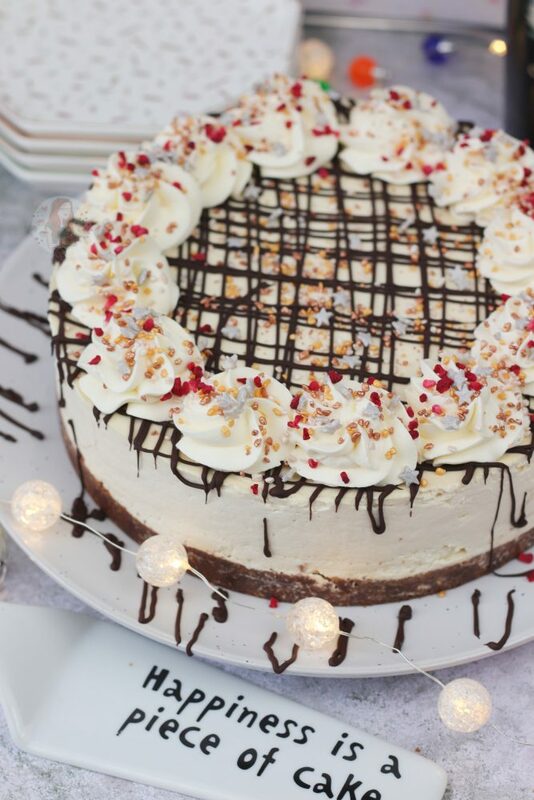 Going to give this cheesecake a go but like your others can you use part cream cheese and part mascarpone? Hehe thanks Claire! 🙂 It was so yummy!